Universal City, CA, USA (April 11, 2014) /PRNewswire/ — “Despicable Me Minion Mayhem,” an original 3D Ultra-HD adventure, and “Super Silly Fun Land,” an immersive carnival setting – both based on Universal Pictures and Illumination Entertainment’s worldwide blockbuster “Despicable Me” franchise – celebrated their dynamic grand opening today at Universal Studios Hollywood. Among the many surprises inspired by the beloved films, guests will be “turned into” an army of iconic Minions and embark on a secret training mission. 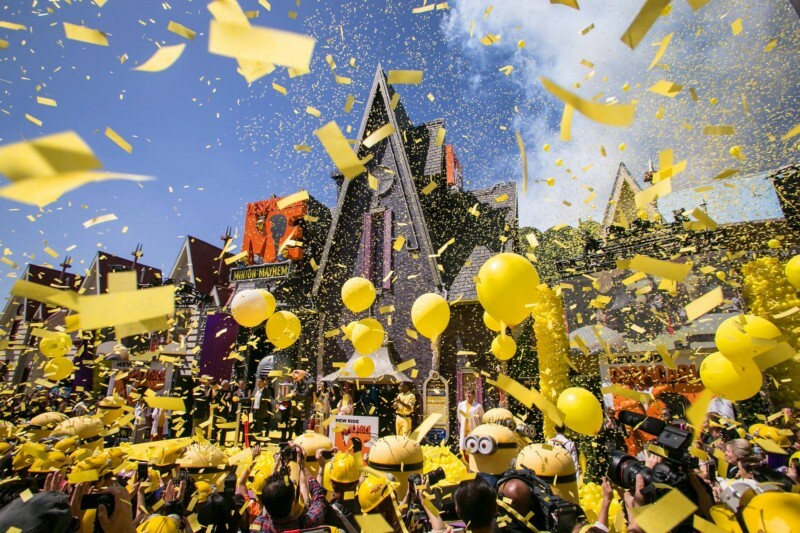 “Despicable Me Minion Mayhem” officially opens to the public at Universal Studios Hollywood on Saturday, April 12, 2014. The world premiere was attended by many Minions parading along the yellow carpet, who were joined by Chris Meledandri, founder and CEO of Illumination Entertainment; Ron Meyer, Vice Chairman of NBCUniversal; Tom Williams, Chairman & CEO of Universal Parks & Resorts; and Larry Kurzweil, President of Universal Studios Hollywood. L.A. Mayor Eric Garcetti made a special guest appearance to show support for the theme park’s newest addition, speaking to an enthusiastic crowd about Universal Studios Hollywood’s long-term impact on tourism in the region. Also in attendance were “Despicable Me” series stars, including Miranda Cosgrove (Margo), Dana Gaier (Edith) and Elsie Fisher (Agnes), who were joined by versatile entertainer and host of EXTRA, Mario Lopez; the cast from NBC’s “Crisis,” including Stevie Lynn Jones, Lance Gross, Joshua Erenberg, Max Martini and Max Schneider; TGT recording artist, Tank; HBO’s “Band of Brothers” star Neal McDonough; Syfy’s “Face Off” host,McKenzie Westmore; and Ultimate Fighting Champion Chuck Lidell. Voiced by the film’s original stars, the fully immersive motion-simulator ride features the lovable cast of characters who have resonated with audiences across the globe: (former?) super-villain Gru (Steve Carell), his adorable girls – Margo (Miranda Cosgrove), Edith (Dana Gaier) and Agnes (Elsie Fisher) – and an army of unpredictable Minions, voiced by Pierre Coffin. As if lifted from the world of “Despicable Me” and placed within Universal Studios Hollywood, the “Despicable Me” ride welcomes guests to ‘Minion Mayhem’ via Gru and the girls’ idyllic suburban neighborhood, re-created with precision to mirror their ominous house and Miss Hattie’s Home for Girls. Whimsically themed queues, clever preshow videos and comedic dialogue set up Gru’s nefarious plot: to create an army of Minions from guest recruits. As guests enter Gru’s living room, they will encounter many memorable artifacts from the series, including his notorious SR6 Shrink Ray and rhinoceros chair, and then make their way into Gru’s super-villain laboratory. The exciting journey will send guests, who wear wearing specially-designed 3D “Minion Goggles,” on an excursion through the humorous Minion training mission. Soon, guests will actually become Minions themselves. A post-show Minion dance party invites everyone to join in the impromptu fun and celebrate the anniversary of Gru and the girls becoming a family. 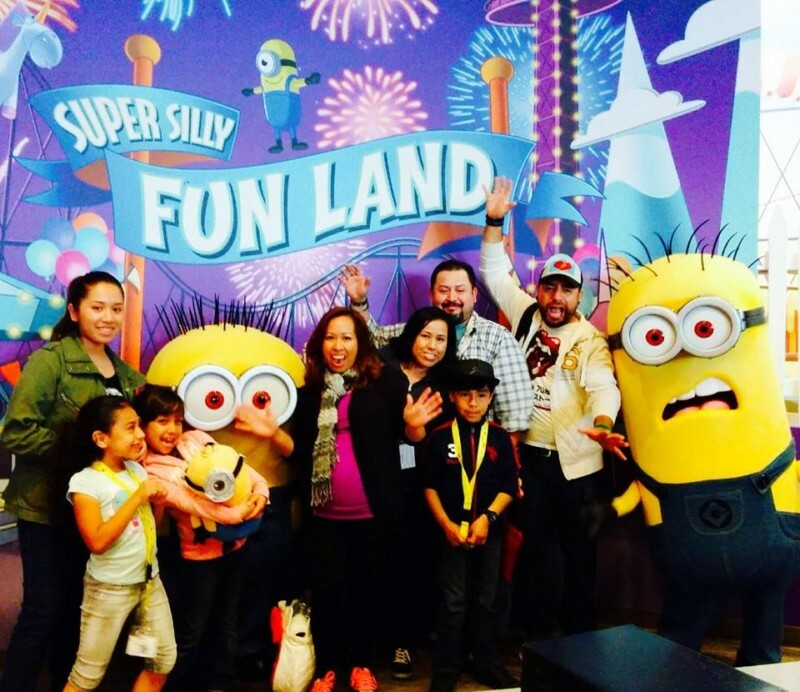 “Super Silly Fun Land,” an all-new elaborate carnival setting and play zone unique to Universal Studios Hollywood, is just adjacent to “Despicable Me Minion Mayhem”. Who doesn’t remember when Gru took the girls to the seaside resort in the first film and “won” Agnes the iconic fluffy unicorn? Now, guests can win a unicorn of their own and roam this uniquely stylized environment, which until now could only be enjoyed on the big screen. The colorfully themed, interactive Minion-inspired outdoor venue will entertain guests of all ages with more than 80 different water play features. A nearby dry zone will invite guests to climb, jump and slide – while a Minion-themed ride, “Silly Swirly Fun Ride,” will soar and spin guests around for a 360-degree view of “Super Silly Fun Land” aboard a fleet of uniquely-designed ride vehicles. Together, “Despicable Me Minion Mayhem” and “Super Silly Fun Land” represent a distinct, immersive environment within the theme park – reimagined to fully engage guests in the world of Gru, his girls and the Minions, – joining Universal Studios Hollywood’s dynamic roster of award-winning themed attractions.